We are using smartphones as a part of our life. In the unfortunate scenario where the Android device we suffered some damage and we do not backup our data (contacts, files, etc. ), what do we do? Assuming that the loss of the device is irreversible and there is no way to recover we can get them back? The answer is yes. The best solution is to have a reliable service with a strong password and not our digital stuff thrown in here and there. Obvious choice for this purpose is Google with its huge range of services that can cover almost everything for free. Do not hear that "Google is watching us and understand the world someday" because anyway we watch and have ten accounts on different services of dubious quality security, is the best. It is advisable to take advantage of preinstalled functions in our one and Android is to Google, the choices are almost ready. The first thing to do is to go on the track "Menu -> Settings -> Accounts & sync" and activate the "Auto sync". Thus, the changes are occasionally will go automatically to our account on Google. Let's see separate timing for each data type. Obvious solution is Gmail. If we go on our behalf by the computer can activate the path "Settings -> Receiving POP3", the choice comes the email from all our accounts (Yahoo!, Hotmail, corporate) in Gmail. We have everything in one, will never lose anything adverse will go where it belongs, with the labels will stand out with the "Priority Inbox" will be read first major. Easy and simple! No contact, no phone! How many times have we changed the device and pass all by hand, how often we used manual processes and in the end we realized that some contacts are missing? The solution is Google Contacts. 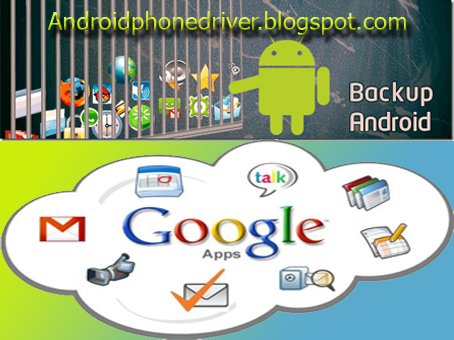 In Gmail you can store all our contacts with too many items such as telephone, email, address, birthday and more.These will automatically synchronize our Android device you never do it again if you change backup device. Each time you add a new contact, if we choose "Contact Google" will be stored automatically in Google our behalf. The Google has a calendar. Indeed it is the basic device calendar automatically synchronizes us. We add this to public calendars that have made other people, as "Greek festivals and holidays" or to share a calendar with our contacts. If we add the birthdays to Google Contacts it shows automatically on device calendar day that we celebrate. All applications you install are stored in your personal account and in our Android Market as "My orders". When you change device, we can enter the Market through our computer and wirelessly send all applications that have established, again in our device. We finish with the services of Google, the Google Music. We can move up to 20,000 music tracks on our behalf and to hear from any device, anywhere we want without being afraid not to burn the hard drive or sdcard device. No option to remove it and the pieces we want in our device, in order to have them permanently available. Instructions to activate here . Besides ... "fashion" is also handy to keep notes on our device. One of the best applications are in Evernote , but for the reasons mentioned above we prefer the Any.Do . This is a Notes application that syncs with Google on our behalf and shows us the additions below the Google Tasks in Gmail. If we add date in the note, we will display it automatically in Google Calendar mentioned above! We come finally to the other records we have in our memory. For this we use the known Dropbox , which we have all our data stored in our account there. If you do not get us the space we can install and Ubuntu One and any other similar service has similar application on Android Market. So there will be no fear if anything happens to the card, we lose our data, which can be pictures, music up to the high score in our games. All of the above (and others not mentioned) can help us not to lose ever again data from our devices and transfer it with ease in our new device by simply login to the service account we use. Those not afraid of the monster cloud, dare it.